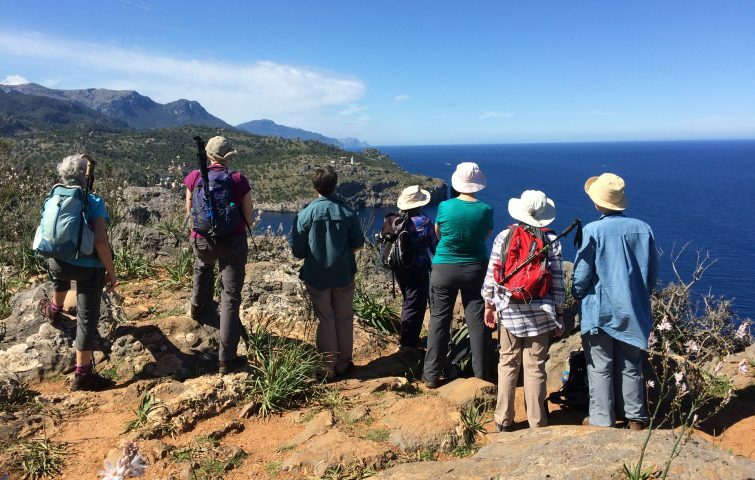 Come along and enjoy a walking holiday discovering the hidden gems of the northwest coast of Mallorca, the largest of the Spanish Balearic Islands. 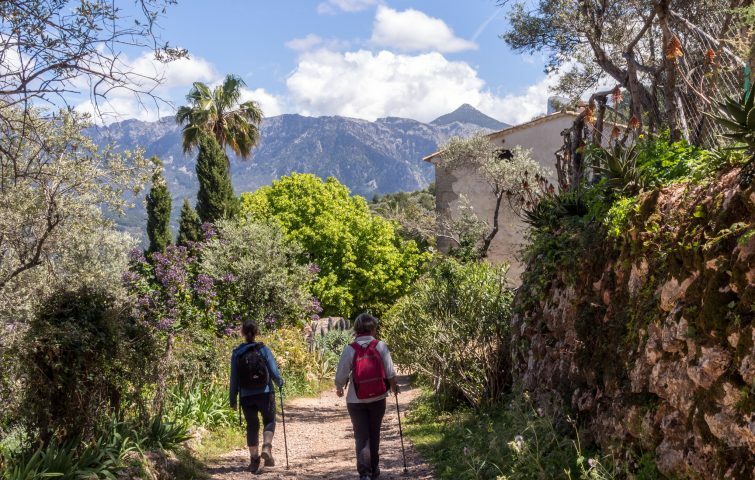 We will explore Mallorca’s astonishingly pretty rural scenery, walking local mule tracks to sleepy villages in the Soller valley, along wooded coastal paths and even tackling one of the gentler stretches of the famous GR221 (Dry Stone Way). 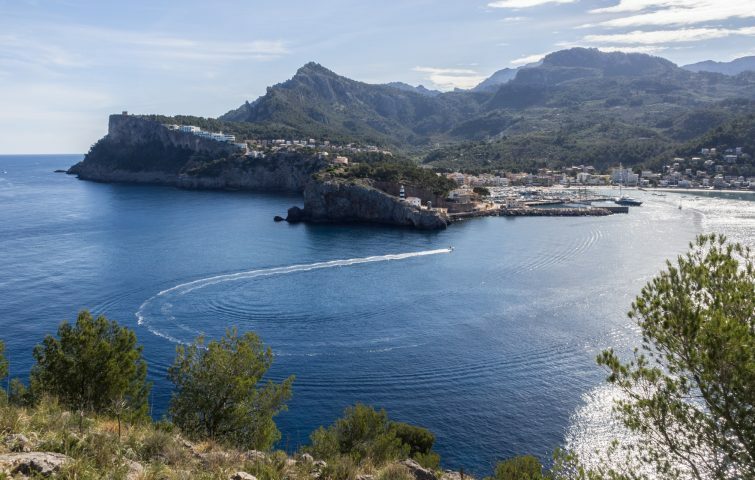 Whilst walking under the Mediterranean sun, we will enjoy panoramic views of the impressive limestone peaks of the Sierra de Tramuntana mountain range and the rugged surrounding coastline with its secluded coves. One of our walks will take us to the stunning artists village of Deia with its bougainvillea-lined alleyways. On our rest day we might choose to explore the charming, and typically Mallorcan, town of Soller with its local market, art galleries and museums or we can enjoy the beach and cafes in Port de Soller – or both! There will be plenty of opportunity to sample the local produce, fresh seafood, tapas, homemade paella and Mallorcan wine too. We will be staying in the newly refurbished Citric Hotel in Port Soller, a basic but comfortable hotel overlooking the charming harbour, beach and promenade lined with cafes, restaurants and local craft shops. Meet at Palma airport for the minibus transfer to our accommodation in Port de Soller. 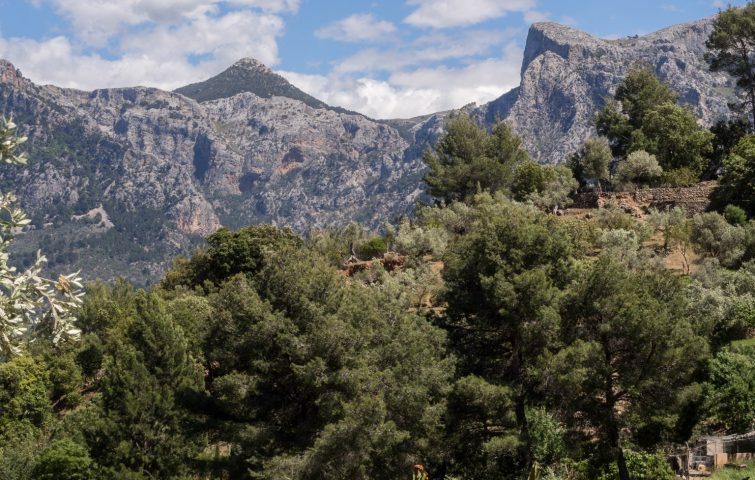 The transfer takes about 45 minutes; our route crosses the central olive growing plain from which the magnificent Tramuntana mountains rise. We cross the mountains via a newly built tunnel and enter the orange blossom filled Soller Valley which nestles between mountains and sea. After settling in to our rooms and having a few hours to rest or stroll along the promenade, there will be a holiday briefing before we walk to a nearby restaurant for our first evening meal. We walk directly from the hotel up to the Torre Picada, the 17thC watchtower which sits on the hill on the other side of the bay from the hotel. At the watchtower we will rest and take in the magnificent view of the port and surrounding mountains and islands. We will then descend the wooded hillside and contour around the coast, mostly on a gravel road, passing olive groves and smallholdings nestling between imposing mountain escarpments and the sea. The hill sides are rich with wild flowers and ring the sound of tinkling of goat bells belying the fact that we are only a mile or two from the busy port and tourist centre. We will have lunch on a terrace owned by an entrepreneurial local who provides cold drinks for walkers before we retrace our steps back to Port de Soller. We take a local bus to the nearby historic artist village of Deia where we can take a look around and visit the local graveyard where many 19thC artists and authors are buried. We will then walk down to the Cala de Deia (the beach/harbour) where we can have coffee and possibly take a dip in the sheltered waters. Our walk then takes us along the forested coastal path passing charcoal burners clearings and small bays before returning to Deia via one of the many paths crossing the hillside. A walk from the hotel to the lovely town of Soller via the lighthouse, Far de Cap Gros, which sits at the entrance to the port. We will walk on mule tracks over the hillside to the hamlet of Can Bleda before descending towards the famous Ferrocaril de Soller, vintage train tracks carrying tourists from Palma to Soller. Arriving in Soller, we will take time to explore the town and take refreshments before catching the bus back to Port de Soller. A free day to relax on the beach, explore locally, visit the famous Arab gardens, Los Jardins d’Alfàbia, or even take the vintage train to Palma. We, again, take the bus to Deia but today our plan is to walk the famous GR221, the Dry Stone Route, from Deia to Port de Soller. We begin with a gradual but continuous ascent to Can Prohom, a gorgeous large Mallorcan farmhouse with an outdoor terrace serving fresh juices, teas, coffee and an amazing array of home-made cakes. From here we take a short diversion from the GR route and head down the lovely quiet valley of Son Sales surrounded by orange and lemon groves, small homesteads and sheep. 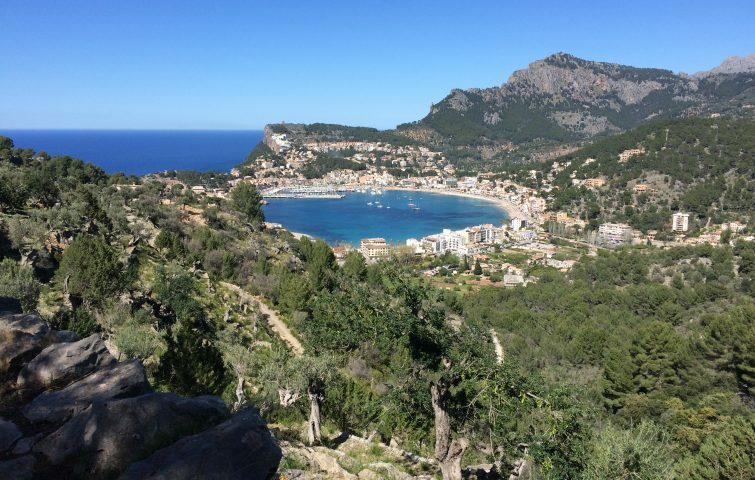 We re-join the GR221 to walk a short distance back into Port de Soller. We take a bus up to the village of Fornalutx. This village, nestled high up in the Tramuntana range, overlooks the Soller valley. Often referred to as the ‘prettiest village in Spain’, the well-preserved stone buildings and red tiled roofs combine with the scent of the surrounding orange and lemon groves to provide a superb example of a traditional Mallorcan mountain village. Its current unspoilt form started taking shape in the 13th century with the Catalan conquests of the island. Today, after breakfast, we say our farewells and head back to Palma airport for our onward journey. Price includes: 7 nights bed and breakfast hotel accommodation in ensuite rooms (single rooms available if you book early – £20 per night); transport to walks; airport transfer at certain times.